Communicability is the cornerstone for the success of the interaction among human beings and the technological (r)evolution in multimedia devices in which a huge part of humankind is immersed. In these devices there is a convergence and intersection of disciplines deriving from the formal and factual sciences. The main goal is to improve the interaction process with the new technologies on a daily basis. Since its origins computer graphics has always been involved in the global village foreseen by McLuhan and has accompanied all the stages of the technological (r)evolution in the multimedia computer sector and telecommunications.Today the variegated devices of massive consumption of microcomputers, deriving mainly from the entertainment sector, have already entered the era of tridimensional vision without using additional peripherals such as specialized glasses or virtual reality helmets. Evidently a new horizon is opening for on-line and off-line multimedia content. Finally, all contributions should be of high originality, quality, clarity, significance and impact. 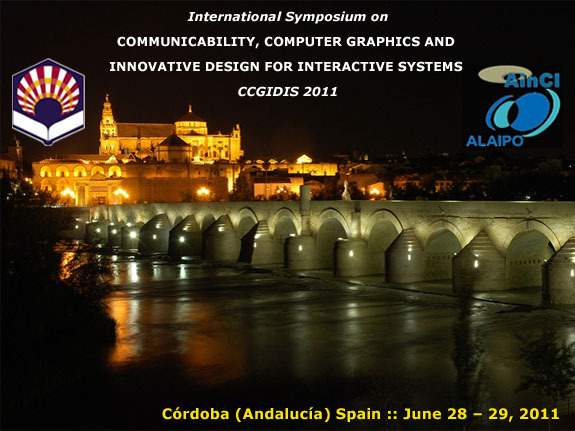 Papers, demos and doctoral consortium related to Communicability, Human-Computer Communication and Interaction, Computer Graphics, Computer Animation, Computer Vision, Virtual Reality, Modelling, Interactive Systems On-line and Off-line, Interactive TV, Audio-visual, Hypermedia, Quality Design, Visualization, Rendering, Imaging, Ubiquitous Computing and other computational areas are solicited on, but not limited.